When the NBA season tips off on Tuesday night, we’ll have a good idea who will win the championship in June. Sorry to Oklahoma City, Houston, San Antonio, Boston or Cleveland (and clearly, nobody else even has a tiny bit of a chance), but the Golden State Warriors are going to win unless something weird happens. That’s practically the opposite of the NFL right now. Some fans like it when a league has a few great teams, or even one great team heading for a coronation. It will be entertaining to watch a fun Warriors club win it all. However, if you prefer parity, the NFL in 2017 is your league. Everything changes from week to week. The term “parity” has been used ad nauseam to describe the NFL for decades now. It was commissioner Pete Rozelle’s dream and it has become a foundation of the league. The draft, free agency, revenue sharing and the salary cap have made sure teams from Green Bay can compete on an even playing field with teams from New York. Despite that, a few teams usually stand out. Who those teams are might change from year to year, but a few always rise to the top. That might not happen this season. Of the 14 games in Week 6, nine of them were won straight up by the underdog. That included shocking upsets by the Bears, Dolphins and Giants. Even big underdogs like the Jets and 49ers came close to winning. The favorite covered three point spreads: the Saints over the Lions, the Titans over the Colts in a game that was close throughout, and the Texans over the Browns (the Browns have never gotten the invitation to the parity party). There’s no sure thing in the NFL this season. Whatever conclusions you came to about various teams Sunday probably won’t carry over. That’s not bad, necessarily. Gregg Rosenthal of NFL.com pointed out, 25 teams either lead their division or are within one loss of the division leader. And we’re more than a third of the way through the season. The beauty of the NFL is that most teams’ fans are still engaged. Almost every team has some hope. Far more teams have at least a small shot of winning a Super Bowl than ever before at this point in a season. There are many good teams, and absolutely no favorite. The NFL’s extreme parity this season leaves us without even one great team, at least to this point. That’s not a knock on the league. It’s great for the NFL’s product that so many teams are competitive. Every game has intrigue. But if you’re looking for your Golden State Warriors of this NFL season, you’ll be looking for a while. Many thought the Patriots would be that dominant team (I definitely did; the Patriots’ ongoing mediocrity is baffling) but they haven’t been great yet. Neither have the Steelers, Falcons, Cowboys, Raiders, Seahawks or any other team that was considered a contender before the season. The Packers looked like they could reach that level, but then Aaron Rodgers broke his collarbone. So much for that. Every team in the NFL is competent, except the Browns. The 49ers are 0-6, but they have lost their past five games by 13 combined points. The Giants were getting slammed all last week after an 0-5 start, and they beat a tough Broncos team in Denver. The Chargers were 0-4, but they’ve won two straight road games. Everyone says the Bears are awful, but they have wins over the Steelers and Ravens, and should have beat the Falcons if not for some dropped passes in the end. Nobody is that bad. There are no pseudo bye weeks against Rutgers or Kansas in the NFL. Don’t bemoan the lack of a great team without acknowledging that the “bad” teams in the league are still good – except, of course, the Browns. 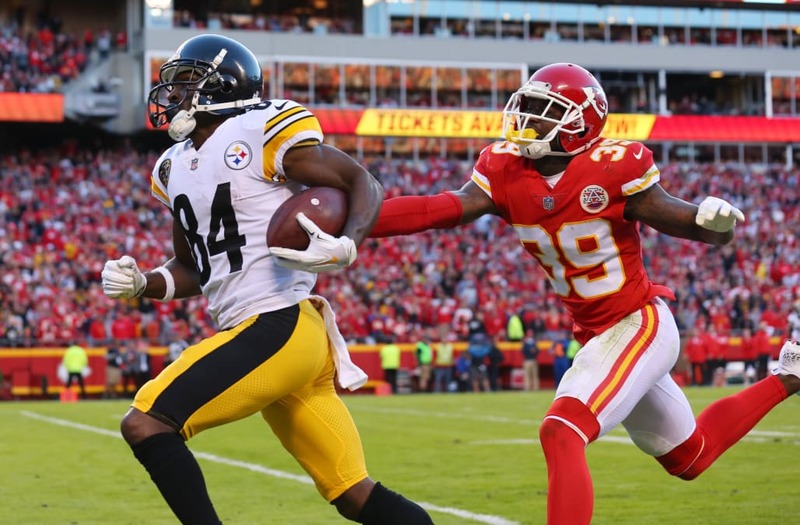 And even the Browns lost by only three points to a Steelers team that just won a road game at the Chiefs, who were the last undefeated team in the NFL. This is the NFL in 2017. It’s no more predictable than a spin of the roulette wheel. The NFL is set up so every team shouldn’t be that good or that bad for too long. That makes the Patriots’ dynasty so impressive. It also makes the Browns’ utter futility impressive too, in a different way. I look at how the Jets being competitive every week, how the 49ers are fighting, and it makes it a lot harder to defend Hue Jackson. The Browns’ roster is bad, but it’s not that much worse than some of these other teams’ rosters. Yet they’ve lost 21 of 22 under Jackson and they’ve lost by double digits in 13 of Jackson’s 22 games. They have been outscored by 251 points in those 22 games. That’s not supposed to happen in today’s NFL. I’ve said it before, but I’ve gone from thinking the Browns had to keep Jackson around for four years no matter what to wondering how the Browns could justify bringing Jackson back for a third season. This really is the most competitive 0-6 team in NFL history. According to Josh Dubow of the Associated Press the 49ers have been outscored by 33 points, and the second lowest total for an 0-6 team is the 2000 Chargers at minus-84. It’s hard to believe the 49ers’ luck in close games will continue to be this bad. It also sums up the parity of the league: Any team from 31 on down can point to a few plays here or there making a big difference in their record. I don’t understand how a player like T.Y. Hilton finishes a game with one catch for 19 yards. I don’t care how the Titans covered him. That’s on the coaching staff for not getting their best player the ball more often. Mitch Trubisky’s development will be the story of the season, obviously. He hasn’t been very consistent, and didn’t play well Sunday, but then he makes a few big plays and reminds you why he’s on the field. His completion to Kendall Wright on third down in overtime set up the game-winning field goal, and was a play you want to see from a top-end quarterback. Now, he needs to do that consistently. I’m still not sure how that Austin Seferian-Jenkins play wasn’t a touchdown. There’s no room for moral victories in the NFL, but I’m more impressed with the Jets after they gave the Patriots all they could handle. Everyone forgot that Adrian Peterson was the NFL’s rushing champ in 2015. That wasn’t too long ago. Just when we thought Peterson was finished, he looks like his vintage self on Sunday. This could end up being one of the best stories of this NFL season if it continues. Rookie receiver John Ross returned to practice. If he can stay healthy and contribute, the Bengals offense might not be all that bad the rest of the way. It has looked much better since the change at coordinator. The Ravens got a punt return for a touchdown, a kickoff return for a touchdown and still lost to the Bears at home. They’ll win games because they’re well coached and tough, but every win will be ugly. They lost Week 1 after a potential game-tying field goal was blocked in the final seconds. In Week 2, they missed a game-winning field goal in the final seconds. Give the Chargers either one of those games, or even both, and we’re talking about a much different outlook. NaVorro Bowman isn’t what he was in his prime, but he’s an upgrade over what the Raiders had at inside linebacker. They need help right away because a 2-5 start would be a really big hole to dig out of. It’s pretty amazing they’re 3-2, because with all the angst about their offense it feels so much worse. Still, a team that averages an NFL-worst 155.4 passing yards per game isn’t going to keep winning much, you’d have to think. Monday night was the kind of game you need to see before you crown someone a franchise quarterback. The Titans desperately needed Marcus Mariota to play through injury. He did, and played well. The Titans needed that badly. What will be lost from Sunday’s loss to the Rams is that the Jaguars defense was quite good. They allowed 124 passing yards and just 12 first downs. But the Jaguars gave up a kickoff return touchdown and a touchdown on a blocked punt. It has to be disheartening the Jaguars defense to be just 3-3 right now. The next four games: vs. Tampa Bay, vs. Oakland, at N.Y. Jets, vs. New Orleans. None of those games seem too daunting. The Bills could make a nice statement over the next month if they play well. Let’s get this out of the way: Anyone clamoring for someone other than Brett Hundley to start isn’t thinking clearly. Hundley might be good, he might be bad, but it would be crazy for the Packers to not see what they have. I’m optimistic Hundley can keep the Packers competitive. Any time he has gotten a shot in the preseason, he has played well. You owe it to yourself to find out what he can do in the regular season, after getting the first-team reps in practice. The Packers are no longer Super Bowl contenders, but grabbing a playoff spot isn’t crazy. But the combination of Aaron Rodgers’ injury and the seemingly endless injuries at other positions certainly makes it tougher. That was a bad loss to the Saints. The Lions tried their typical rally after falling way behind, but then started turning it over again in the fourth quarter. They’re your typical NFL team in 2017: After four weeks people (rightfully) said they were a few inches against the Falcons from being 4-0. Now they’re 3-3 and look to be backsliding badly going into their bye week with a game against the Steelers on deck. The good news is their schedule after that, with the Aaron Rodgers-less Packers still to come twice, is pretty easy. The Cowboys weren’t good with Ezekiel Elliott, their best player last season. Now we have to assume Dallas will be without him for six games. This isn’t the same Cowboys offensive line, and you can’t just plug and play Darren McFadden or Alfred Morris and expect big numbers. This is on Dak Prescott to keep the Cowboys in the playoff race. Big spot for the young quarterback. There might be no better example of an NFL team taking a U-turn out of nowhere and changing who it is. Through two weeks the Saints’ pass defense, which has been terrible for years, was allowing an astonishing 141.4 passer rating. In the three games since then, they’ve allowed a 69 rating. No warning, they just did a 180. Now go figure out if they’ll sustain that. Clearly the team that stands to gain the most from Aaron Rodgers’ injury is the Vikings. They got a key win Sunday against Brett Hundley coming in off the bench, so they’ve already benefited. If the Vikings don’t take advantage of this and win the NFC North, it’ll be a pretty big disappointment. Houston has a bye, and then a date at Seattle. That’s a tough place to play. If Deshaun Watson plays well there, then it’ll be pretty clear he’s going to be a star. That might be obvious already. Sunday’s debacle against the Giants brought on another round of some Broncos fans griping about Trevor Siemian. It’s fairly useless. The Broncos aren’t acquiring anyone better during this season. It’ll be hard for them to draft anyone who’s not a gamble, considering they won’t have a high pick. They already gambled once with Paxton Lynch, and that hasn’t worked out yet. Maybe they could go all-in on Kirk Cousins if he becomes a free agent, but there is going to be a lot of sticker shock with his contract. It’s probably best if Broncos fans just get used to having Siemian as their quarterback. On a day when the Rams passing offense didn’t do much, Todd Gurley was huge. He had 116 rushing yards against a tough defense. That’s what you need out of a foundation running back. – Held on to beat Chicago when the Bears dropped passes in a goal-to-go situation in the final minute. – Beat the Lions when Golden Tate was ruled inches short of a touchdown on replay review and a 10-second runoff ended the game. – Lost at home to the Bills. – Lost at home to the Dolphins after leading 17-0 at halftime. All of a sudden it looks like the Super Bowl loser hangover got to them, after all. Chris Thompson finally got a chance to get significant carries. He turned 16 carries into … 33 rushing yards (he did have 105 receiving yards). That will be the last time Jay Gruden gives him that many carries. The most interesting story line leading up to the trade deadline on Nov. 1 might be if the Seahawks make any moves to improve a bad offensive line. They talked to Branden Albert but haven’t signed him. You get the sense the Seahawks need to do something. I don’t understand coaches who bench a player who fumbles once, unless there’s some history of fumbling. Mike Gillislee had one fumble in 28 career games before Sunday. After he fumbled, he was benched and played just 13 snaps. I’m not really sure the point of that. Letting a guy with one fumble in 28 games know that he shouldn’t fumble? There’s some question if Luke Kuechly suffered a concussion last week, according to the Charlotte Observer. ESPN’s Adam Schefter said Sunday the team didn’t think he suffered a concussion, but a Panthers spokesman said later Sunday that Kuechly was still in the concussion protocol and hasn’t been cleared. Hopefully Kuechly is cleared or gets cleared and we never have to worry about another concussion with him. The Steelers tweeted out Martavis Bryant talking to the media after a game about a reported trade request. They commented, “Martavis Bryant says he is happy to stay in Pittsburgh.” Go ahead and watch this video and tell me if it seems like he’s really happy. There is a surprising amount of discord surrounding the Steelers lately. A good argument can be made for them being No. 1. However, they played the No. 1 team and lost. It was a competitive game in Kansas City, but it’s still part of the resumes. I’m not a fan of pollsters automatically moving the No. 1 team down due to a loss. Let’s examine the full body of work. The Chiefs have a fine set of quality wins (at New England, vs. Philadelphia, at L.A. Chargers, vs. Washington, at Houston). The loss against Pittsburgh wasn’t a bad one. Despite a rough day Sunday, they’re second in yards gained this season. The overall defense has given up a lot of yards, but the pass defense is solid and capable of making plays. If you take all six weeks together and don’t get caught up in recency bias, they still deserve the top spot.